Going Deep: Players that could sneak into the first round. This video is not available for this device or operating system. 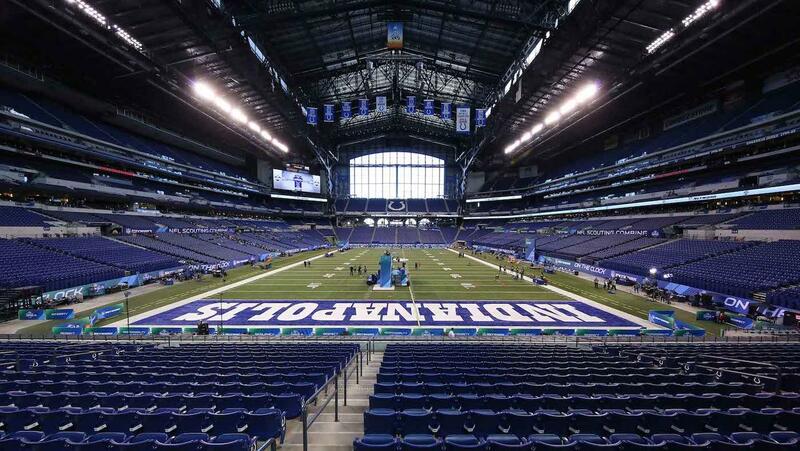 Though the 2017 NFL Scouting Combine officially kicked off Wednesday, Thursday was the first day of actual athletic testing and player interviews with the media. Bench press numbers are not the greatest barometer for future success in the NFL for offensive linemen, but gaudy numbers do suggest that a player possesses an NFL work ethic. 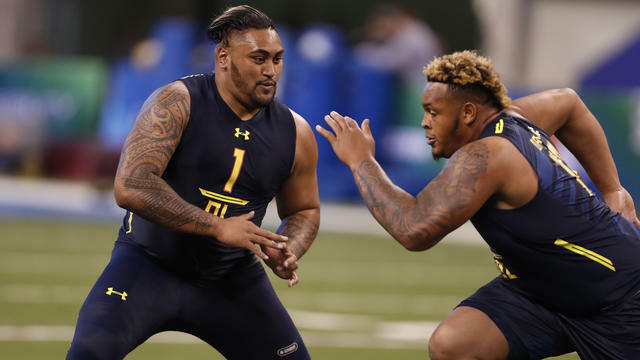 Offensive linemen showing off their strength in the bench press was the first athletic testing to be completed at the 2017 NFL combine, and the results produced some early winners, including Utah’s Isaac Asiata. The Utes lineman led all of Thursday’s competitors with 35 repetitions of 225 pounds, narrowly beating out TCU’s Aviante Collins, Texas A&M’s Jermaine Eluemunor and Western Kentucky’s Forrest Lamp, who each managed to push up the bar successfully 34 times. Though Temple’s Dion Dawkins registered “just” 26 repetitions, scouts will note that no one pushed up the bar more with arms as long as his (35 inches). Top-rated offensive tackle Ryan Ramczyk eased questions about his size (6-feet-6, 310 pounds) and strength (25 repetitions with 33 3/4-inch arms), the same length as Asiata’s. While there were certainly some weight room winners, Southern Cal’s Chad Wheeler did not help his cause by lifting the bar “only” 15 times, especially given that he has just average arm length for the position (33 1/8 inches). This is a significant contrast to Florida’s David Sharpe, who might have only pushed the bar up four times more than Wheeler but did so with arms a full 2 1/2 inches longer than USC’s first-team All-Pac-12 left tackle. While some of this year’s offensive linemen failed to deliver in the bench press, the highly regarded running back class certainly performed admirably. While his former Sooners teammate Joe Mixon has been the talk of the combine for not being allowed to participate , Samaje Perine stole the spotlight with an eye-popping 30 repetitions, among the highest totals in modern league history for the position. Former Wake Forest turned New York Jets fullback Tommy Bohannon posted 36 repetitions in 2013. The more important test for the bullish 5-11, 233-pound Perine might be the 40-yard dash, or else he could be viewed as a possible fullback convert himself. Among the other notable bench press results among running backs was the 22 repetitions from projected first-round pick Dalvin Cook, 20 from Pittsburgh’s star runner and cancer survivor James Conner and 18 from Texas Longhorns back D’Onta Foreman, who measured in significantly smaller than expected at 6-feet and 233 pounds after being listed at 6-1, 249 on the team’s website. LSU superstar Leonard Fournette elected not to compete in the bench press drills, announcing to the coaches and scouts attending the workout that he was choosing to wait until his pro day to compete in this drill. 4. Will arthritic shoulders drop Alabama’s Allen? While Thursday’s athletic testing produced the quantitative data the combine is famous for, one of the big stories circulating around Lucas Oil Stadium was a report from NFL.com’s Ian Rapoport that Alabama defensive lineman Jonathan Allen is dealing with arthritic shoulders. 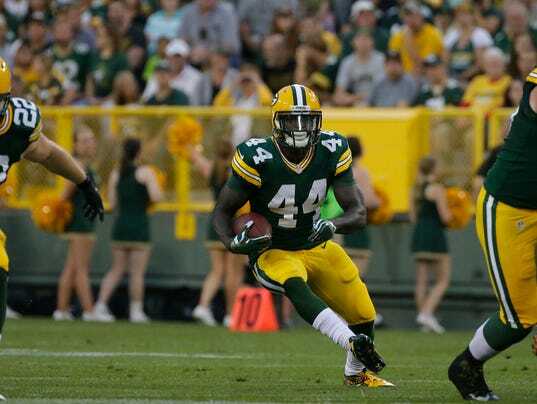 The offseason is underway in Green Bay.